This unusual historic site has one of the most atmospheric locations in Wales. 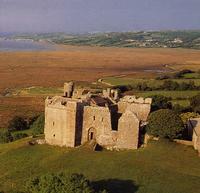 It stands in a lonely spot on the low-lying northern coast of the Gower peninsular, overlooking an eerie, bleak expanse of saltings and marshland. Weobly, built by the de la Bere family, dates from early 14th century. However, it is not quite what it seems. Despite its name, Weobley Castle served more as a fortified manor house than serious military stronghold. This well-preserved, substantial site reveals plentiful evidence of its owners' over-riding desire for creature comforts. Domestic necessities such as a fine hall with fireplace, private rooms, sizeable guest chamber and numerous "garderobes" or toilets can be seen, along with decorative windows which demonstrates the de la Bere's regard for elegance and good craftsmanship as well as convenience. In the late 15th century Weobley came into the ownership of the powerful Sir Rhys ap Thomas, ally of Henry VII. He further upgraded the house, improving the entrance to the hall and private apartments by the addition of a new two-storey porch block. Today's visitors to Weobley can not only admire one of the few surviving fortified manor houses in Wales but also visit an exhibition on its history and other ancient monuments on the Gower peninsula. B4271, or B4295 to Llanrhidian village, then minor road.